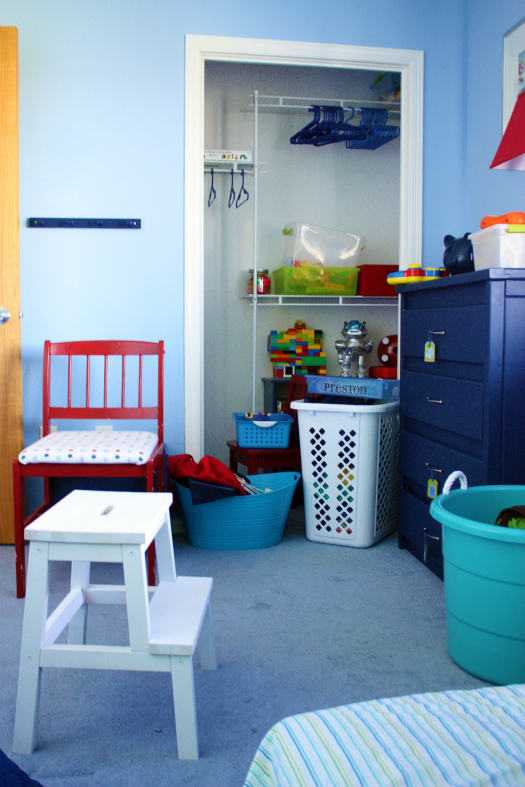 This weekend we are totally tackling the shared boy's bedroom! I am beyond excited to finish up a project that got put on the back-burner for oh, say going on 9 months!? From a distance and in photos, not so awful. However, in person, the room is an extreme unfinished hodge podge and is uber itty bitty for two little guys. Of course, as we move along with finishing up their space, many of the items will stay, lamps, accessories, art, bedding, chairs, window treatments, etc... but it's absolutely time for a freshening! Stripes and maps. Love them both, and together, I swoon. The boys already have somewhat of an airplane theme, and I am not typically one for themes, so I am planning on keeping with the airplanes, but at a minimal level. The plan is to sell the bunk beds and use two separate beds instead. We already have the two matching blue quilts. I would love to go with red headboards. I would like to bring up the white desk from our previous playroom and replace the light fixture. The stripes, love love love. We will just see how much I love them when I am trying to paint them at 2:00 a.m. And the map. I think a giant giant map framed out in red would be divine! 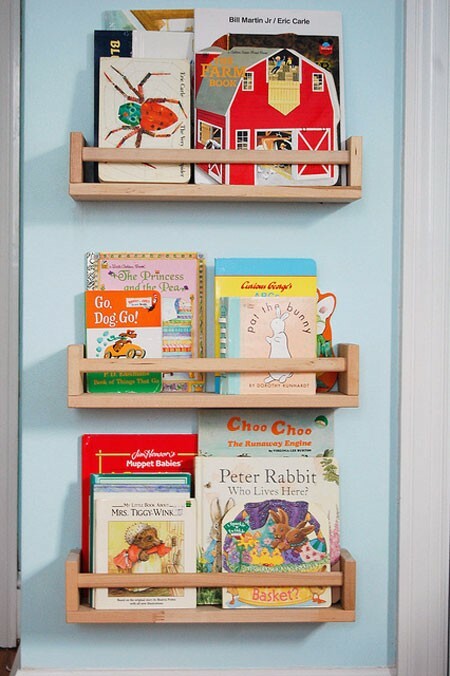 We also need to come up with cute book storage, ledges of some sort I am sure! Or gutters or spice racks since I have heard those work well also! Oooh, and we are completely updating their closet space to be WAY more functional! And we adore the lamp and artwork, they will re-appear in the new space! 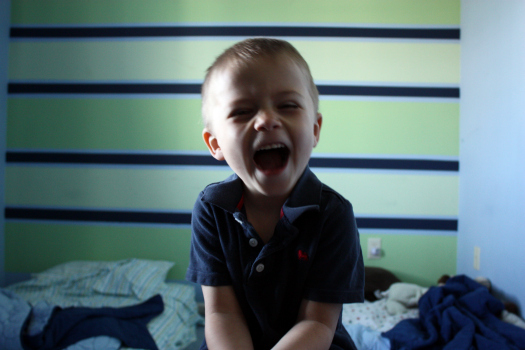 And how does Parker feel about the idea of a new bedroom? He's pretty excited! So stay tuned, hopefully come Monday, we will have made progress! I told the hubs all I want for mother's day is a day of project completion, and the best part is the boys can totally dig in and help and we can all do it together! I have this light fixture picked out in the Style Tile above, but I am not sure I LOVE it. Anyone else have ideas for me based off of the direction the room is going? LOVE it Jen! I can't wait to see in finished! Quick question -- how to you create the "Style Tile"? I've been wanting to pull something like this together for spaces in my house. Did you just take pics off the web and collage them in Picasa or photoshop? Your boys' room is going to be darling! I love everything you have planned! Whenever I get fed up with something (like how you're fed up with the bunk beds and I was recently perturbed with a big awful desk my husband has had since bachelor days), I actually prefer the empty room look. I look at the picture with the 2 mattresses in the floor and take a deep peaceful breath. I'd rather empty than cluttered with the wrong stuff! For a great space saver ~ our bed frame (& our 14 year daughter) has the dresser drawers. My husband has 3 & so do I. I love it! 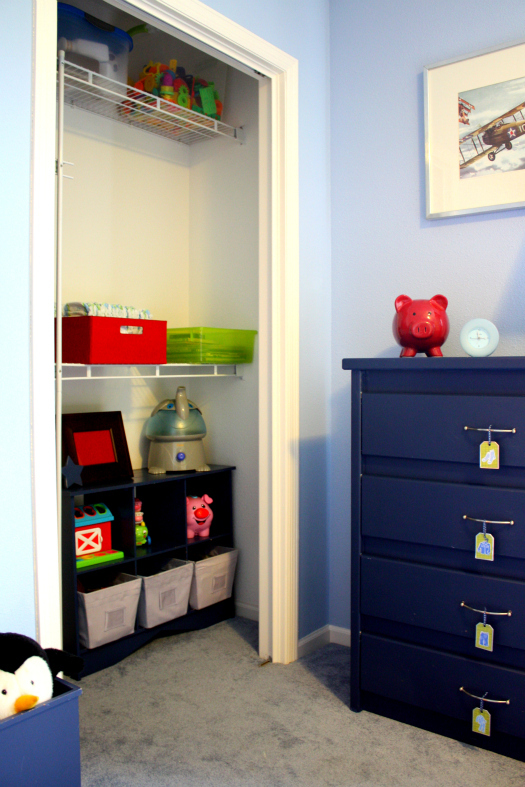 Another blog I love, Thrifty Decor Chick, did her sons room in a similar theme. Here is the url to the post that best shows off some of the neat details. I think if you spiced up your inspiration lamp you could find yourself in love with it! Good luck! I can't wait to see the results! So excited to see a huge map! Love it! Also, I'm not sold on the light. What about the IKEA Fillsta? http://www.ikea.com/us/en/catalog/products/40155009 Hung on a very short cord, I think it would look great! Just my opinion, though. I know whatever you do will rock. If you are DIY-er, you probably would love Knock Off Wood. She has great small projects for shelf and kids stuff. She does knock offs from Pottery Barn and Land of Nod, and then tells you in detail how to build them. Love the airplane picture, do you remember where you got it? I just re-arranged my boys room (also shared, small, with bunk beds) You can check it out at http://timberandlace.blogspot.com/2011/05/changing-it-up-in-boys-bedroom.html. We have the same airplane kind of theme going on. Love your style tile and can't wait to see how it turns out. I am looking for a few small details to finish off my boys room and would love to maybe incorporate maps. I can't wait to see how this turns out! I am amazed at your ability to bring a vision to a reality. And, omg, your little boys are so cute! Have a happy, happy Mother's Day~!! I'm Loving where this is going, It's making me what two little boys of my own! haha Seriously though! 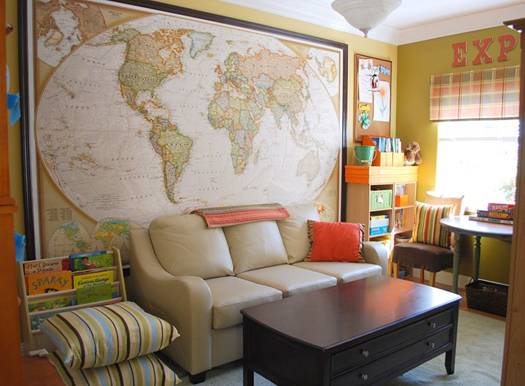 Not sure if you'll have the wall space or if it's durable enough for 2 boys ;) but perhaps it will inspire a solution. Oh I can't wait for the reveal! 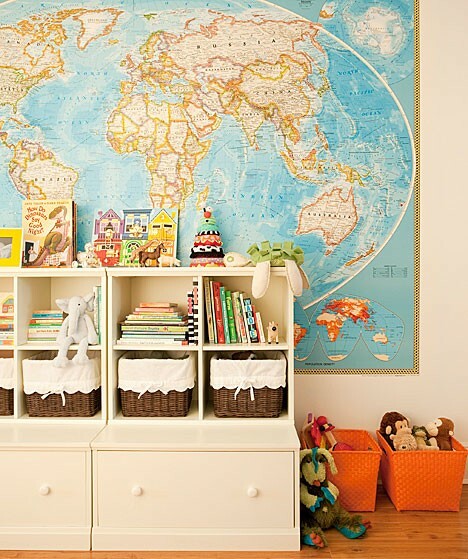 I need those maps for my daughter's study area! 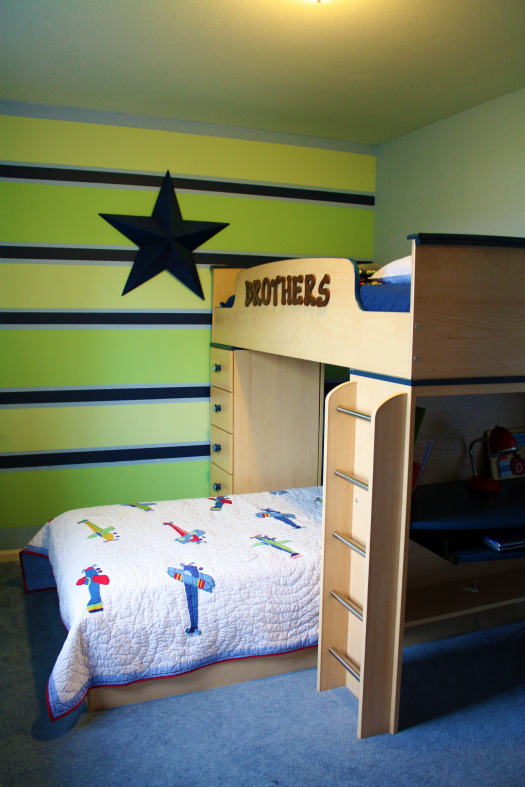 Love, love, love your blog and the design for your boys room. 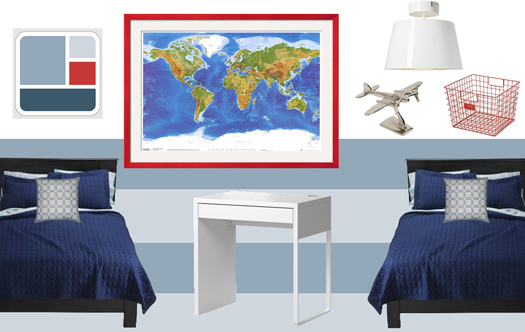 I am currently re-doing my son's room and will be incorporating a map. Would you please post where you find your map? I have been looking online and have found several options, but I love your design style and would love to know which map you choose. PS: I grew up in WI...my parents are visiting from Waukesha. there is a segment in this episode about little built in shelves next to the kids' beds - I love this idea! Just thought I'd share. love love love your blog!! AND your photos! Also, I notice that the pictures you love have white bedding. From a mom with three boys, I would steer you away from white. All it takes is a boy with a pocket-full of dirt to ruin a beautiful white spread. I LOVE, LOVE, LOVE your blog! I first ran across it when I was participating in Simple Mom's: Project Simplify. I had hoped to "win" one of your style tiles; between that and seeing everyone's before/after pics, it inspired me to join along. I now have beautiful closet/drawers throughout my house! 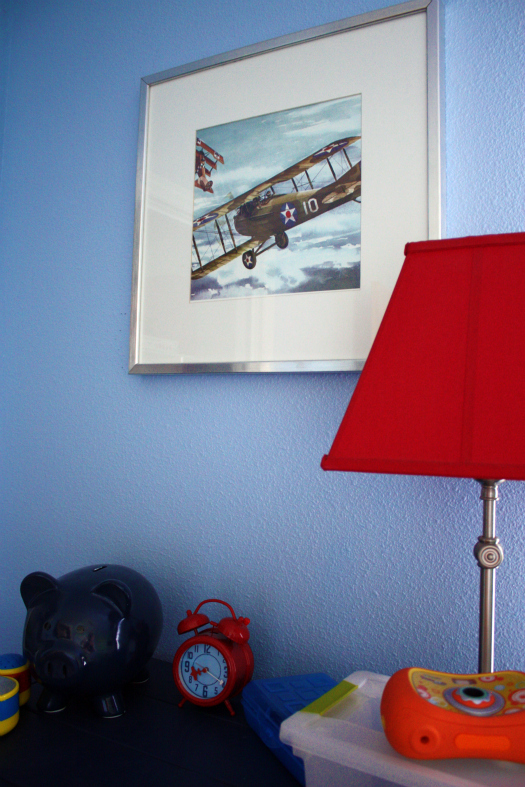 I'm actually working on redecorating my toddler's room this week as well (boy, 4 & girl, 3). 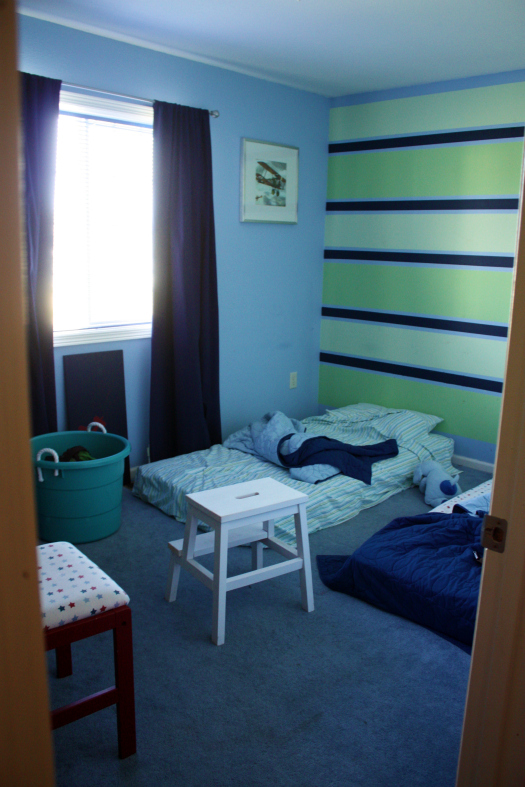 I got some ideas from your blog even :-) I can't wait to see the reveal of your boys' room! I have been eyeballing these 2 light fixtures from Lowes for my son's room (also done in airplanes but severely lacking storage for toys/books). Love the inspiration! I can't wait to see what you come up with. Happy early mother's day! Oh wow! This is going to look great. 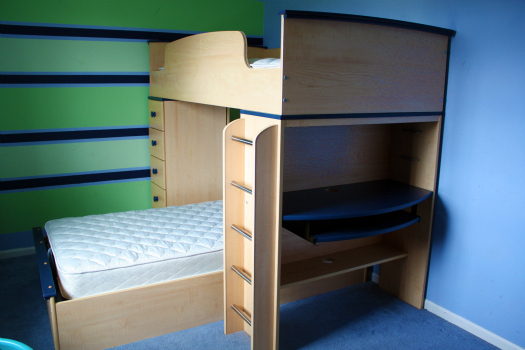 We are actually looking at getting a bunk bed for our boys but they are still a bit too young. We can see the fights already! I can't wait to see your progress and end result. Good luck! Such a wonderful post! So many great ideas! I have to tell you that you were my inspiration to check out pinterest and now I just can't stop pinning, it's completely addicting! Now for a random question, but I noticed that you have the most incredible little 2 step stool in white in the pics of your boys room. I have been searching all over the place for something exactly like that for my little guy. One step just doesn't "do it" for him. Any chance you would share where you found it? Style tile - such a great name. Love the large map mixed in with the airplanes. Makes me think of a world traveler. Have you considered switching things up and using a globe light? I recently ordered this for my sons room. We'll see how it turns out. You said red headboards and I immediately remembered seeing these from Ana White (another blog I check daily!). Unless you want the beds to have storage these seem to work for the look you are going for. I love stripes and maps..the perfect combination! In fact, I pinned your inspiration bedroom with the twin beds and map wall paper and said the exact same thing you did before I even finished your post. Brilliant! Ah stripes. So fun on the walls but terrible to remove! 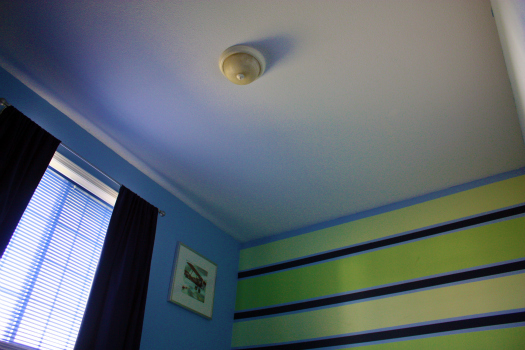 I just repainted my boys room and after spending all day sanding down the stripes I swore I would never paint them again! Of course I probally will as I really do like them when they are finished and I don't have to paint over them! Can't wait to see what you do with your boys room! I love the ideas you have for the space. The Ikea Rutbo lamp would be a good choice too- it would actually carry the stripes through in a new way. Hey Jen. 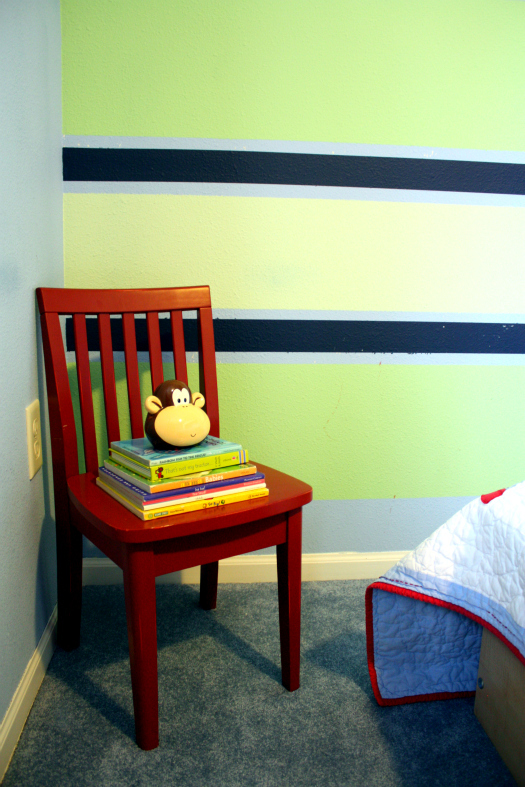 Wow, I would love to show you my son's room because I did his room in big thick stripes and I love it. I could snap a few pics for ya but it may be too late if you are already in progress. He has an old fashioned car/plane theme a bit in there too....Pottery Barn bedding. Same color scheme as you are using. 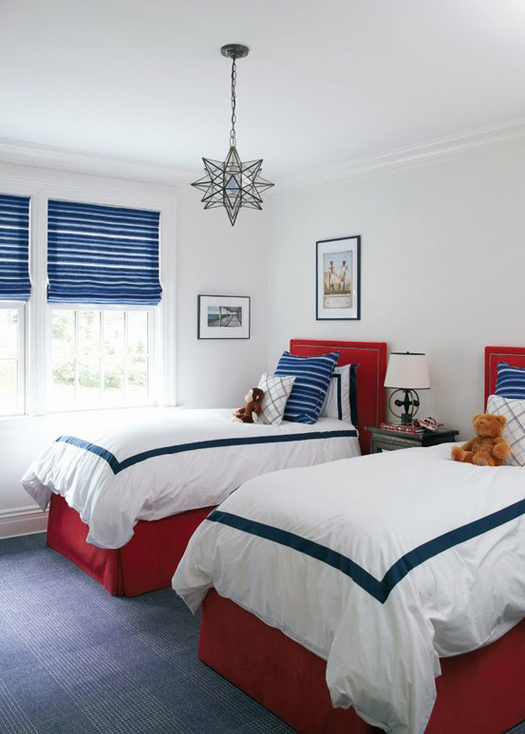 Wall are light blue and cream stripes and accents are red and navy. Great combo. Bedding has some patchwork cars that are done with some cordoroy. Love the maps! Several years ago on TV I saw a nautical/map themed room and they had a ceiling fan that had a "compass rose" painted on the ceiling above it, with the compass points North South East West labeled in red and navy. The fan blades were oars. That could go well with your map and your airplane photo. Maybe the fan blades could mimic helicopter propeller! That could be a combined fan and light fixture. LOVE this room and I'm about to put 3, yes I said 3! boys into one room :( can you say full over full bunks? Yikes! Thanks for listening LOL any suggestions appreciated! I love the keeping it real photo! I literally laughed out loud when I read your comment. I can't wait to see how their room turns out! I can't wait to see what the end result would look. But I know it will be so lovely for your little Parker.. Goodluck!! Hope you can post the after result soon ..
Is there an online site where you put together your Style Tile? Where did you find that gorgeous bunk bed for the boys? HI!, New to your site and have two boys sharing a room. I am looking for simple quilts like yours. Will you share where they are from??? The blue quilts are from Target and they are CIRCO brand in the children's bedroom section. They have held up wonderfully throughout the years!